As of 2012/05/01, CFS forecasts are switched to CFSv2. Hover mouse on items to see more info. MonitoringVIC predictions forced with NLDAS-2 assimilated surface meteorological fields. validated 2016/10/06 2016/09/29 2016/09/22 2016/09/15 2016/09/08 2016/09/01 2016/08/25 2016/08/18 2016/08/11 2016/08/04 2016/07/28 2016/07/21 2016/07/14 2016/07/07 2016/06/30 2016/06/23 2016/06/16 2016/06/09 2016/06/02 2016/05/26 2016/05/19 2016/05/12 2016/05/05 2016/04/28 2016/04/21 2016/04/14 2016/04/07 2016/03/31 2016/03/24 2016/03/17 2016/03/10 2016/03/03 2016/02/25 2016/02/18 2016/02/11 2016/02/04 2016/01/28 2016/01/21 2016/01/14 2016/01/07 2015/12/31 2015/12/24 2015/12/17 2015/12/10 2015/12/03 2015/11/26 2015/11/19 2015/11/12 2015/11/05 2015/10/29 2015/10/22 2015/10/15 2015/10/08 2015/10/01 2015/09/24 2015/09/17 2015/09/10 2015/09/03 2015/08/27 2015/08/20 2015/08/13 2015/08/06 2015/07/30 2015/07/23 2015/07/16 2015/07/09 2015/07/02 2015/06/25 2015/06/18 2015/06/11 2015/06/04 2015/05/28 2015/05/21 2015/05/14 2015/05/07 2015/04/30 2015/04/23 2015/04/16 2015/04/09 2015/04/02 2015/03/26 2015/03/19 2015/03/12 2015/03/05 2015/02/26 2015/02/19 2015/02/12 2015/02/05 2015/01/29 2015/01/22 2015/01/15 2015/01/08 2015/01/01 2014/12/25 2014/12/18 2014/12/11 2014/12/04 2014/11/27 2014/11/20 2014/11/13 2014/11/06 2014/10/30 2014/10/23 2014/10/16 2014/10/09 2014/10/02 2014/09/25 2014/09/18 2014/09/11 2014/09/04 2014/08/28 2014/08/21 2014/08/14 2014/08/07 2014/07/31 2014/07/24 2014/07/17 2014/07/10 2014/07/03 2014/06/26 2014/06/19 2014/06/12 2014/06/05 2014/05/29 2014/05/22 2014/05/15 2014/05/08 2014/05/01 2014/04/24 2014/04/17 2014/04/10 2014/04/03 2014/03/27 2014/03/20 2014/03/13 2014/03/06 2014/02/27 2014/02/20 2014/02/13 2014/02/06 2014/01/30 2014/01/23 2014/01/16 2014/01/09 2014/01/02 2013/12/26 2013/12/19 2013/12/12 2013/12/05 2013/11/28 2013/11/21 2013/11/14 2013/11/07 2013/10/31 2013/10/24 2013/10/17 2013/10/10 2013/10/03 2013/09/26 2013/09/19 2013/09/12 2013/09/05 2013/08/29 2013/08/22 2013/08/15 2013/08/08 2013/08/01 2013/07/25 2013/07/18 2013/07/11 2013/07/04 2013/06/27 2013/06/20 2013/06/13 2013/06/06 2013/05/30 2013/05/23 2013/05/16 2013/05/09 2013/05/02 2013/04/25 2013/04/18 2013/04/11 2013/04/04 2013/03/28 2013/03/21 2013/03/14 2013/03/07 2013/02/28 2013/02/21 2013/02/14 2013/02/07 2013/01/31 2013/01/24 2013/01/17 2013/01/10 2013/01/03 2012/12/27 2012/12/20 2012/12/13 2012/12/06 2012/11/29 2012/11/22 2012/11/15 2012/11/08 2012/11/01 2012/10/25 2012/10/18 2012/10/11 2012/10/04 2012/09/27 2012/09/20 2012/09/13 2012/09/06 2012/08/30 2012/08/23 2012/08/16 2012/08/09 2012/08/02 2012/07/26 2012/07/19 2012/07/12 2012/07/05 2012/06/28 2012/06/21 2012/06/14 2012/06/07 2012/05/31 2012/05/24 2012/05/17 2012/05/10 2012/05/03 2012/04/26 2012/04/19 2012/04/12 2012/04/05 2012/03/29 2012/03/22 2012/03/15 2012/03/08 2012/03/01 2012/02/23 2012/02/16 2012/02/09 2012/02/02 2012/01/26 2012/01/19 2012/01/12 2012/01/05 2011/12/29 2011/12/22 2011/12/15 2011/12/08 2011/12/01 2011/11/24 2011/11/17 2011/11/10 2011/11/03 2011/10/27 2011/10/20 2011/10/13 2011/10/06 2011/09/29 2011/09/22 2011/09/15 2011/09/08 2011/09/01 2011/08/25 2011/08/18 2011/08/11 2011/08/04 2011/07/28 2011/07/21 2011/07/14 2011/07/07 2011/06/30 2011/06/23 2011/06/16 2011/06/09 2011/06/02 2011/05/26 2011/05/19 2011/05/12 2011/05/05 2011/04/28 2011/04/21 2011/04/14 2011/04/07 2011/03/31 2011/03/24 2011/03/17 2011/03/10 2011/03/03 2011/02/24 2011/02/17 2011/02/10 2011/02/03 2011/01/27 2011/01/20 2011/01/13 2011/01/06 2010/12/30 2010/12/23 2010/12/16 2010/12/09 2010/12/02 2010/11/25 2010/11/18 2010/11/11 2010/11/04 2010/10/28 2010/10/21 2010/10/14 2010/10/07 2010/09/30 2010/09/23 2010/09/16 2010/09/09 2010/09/02 2010/08/26 2010/08/19 2010/08/12 2010/08/05 2010/07/29 2010/07/22 2010/07/15 2010/07/08 2010/07/01 2010/06/24 2010/06/17 2010/06/10 2010/06/03 2010/05/27 2010/05/20 2010/05/13 2010/05/06 2010/04/29 2010/04/22 2010/04/15 2010/04/08 2010/04/01 2010/03/25 2010/03/18 2010/03/11 2010/03/04 2010/02/25 2010/02/18 2010/02/11 2010/02/04 for Soil MoistureThe drought analysis is based on comparing the current soil moisture against the 54-yr retrospective climatology. The climatology is developed separately for each grid cell (> 55,000 cells in the USA) in the form of a pdf. The original drought analysis (Sheffield et al. 2004) fitted beta distributions to the soil moisture data. In this update we use empirical distributions based directly on the data. 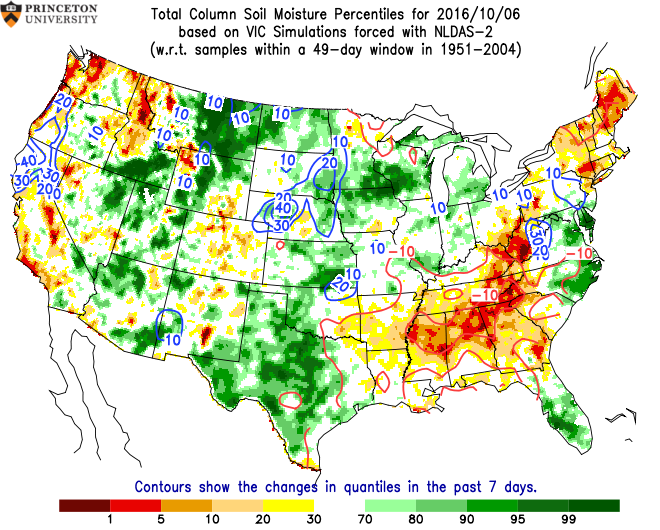 The plots shows the percentile of current soil moisture with respect to the 54-yr climatology defined as all values in a 49-day sampling window centered at the date of validation. SnowSnow water equivalent percentiles calculated against the 54-yr climatology. Streamflow7-day cumulative streamflow percentiles calculated against the 54-yr climatology over selected basins in the East. Precipitation7-day cumulative precipitation percentiles calculated against the 54-yr climatology. ForecastInitialized with monitoring predictions at the beginning of the month, the VIC model makes hydrological predictions, forced with meteorological fields spatially downscaled, temporally disaggregated and bias-corrected from CFS(v2) model forecast, CPC outlook, and ESP forecast. initialized 2015/10/01 2015/07/01 2015/06/01 2015/05/01 2015/04/01 2015/03/01 2015/02/01 2014/09/01 2014/08/01 2014/07/01 2014/06/01 2014/05/01 2014/04/01 2014/03/01 2014/02/01 2014/01/01 2013/12/01 2013/11/01 2013/10/01 2013/09/01 2013/08/01 2013/07/01 2013/06/01 2013/05/01 2013/04/01 2013/03/01 2013/02/01 2013/01/01 2012/12/01 2012/11/01 2012/10/01 2012/09/01 2012/08/01 2012/07/01 2012/06/01 2012/05/01 2012/04/01 2012/03/01 2012/02/01 2012/01/01 2011/12/01 2011/11/01 2011/10/01 2011/09/01 2011/08/01 2011/07/01 2011/06/01 2011/05/01 2011/04/01 2011/03/01 2011/02/01 2011/01/01 2010/12/01 2010/11/01 2010/10/01 2010/09/01 2010/08/01 2010/07/01 2010/06/01 2010/05/01 2009/07/01 2009/06/01 2009/05/01 2009/04/01 2009/03/01 2009/02/01 2008/11/01 2008/10/01 2008/09/01 2008/08/01 2008/07/01 2008/06/01 for Soil MoistureThe drought analysis is based on comparing the forecast soil moisture against the 54-yr retrospective climatology. The ensemble spread is expressed as the interquartile range of the ensemble, that is the distance between the 75th percentile and the 25th percentile of the ensemble, and the distance is expressed as difference between the to soil moisture percentiles in the historical distribution. Drought ProbabilityThe shaded area on the map indicates the probability of the forecast monthly soil moisture being below 20th percentile. A random forecast will give a probabililty about 20%. Therefore,a probability above 20% is considered a shift towards possible drier conditions. A probability above 80% is considered as extremly likely. Preceding MonitoringHistorical weekly monitoring immediately before the forecast initiation. These monitorings may not be the most recent ones. The monitoring month here will change as the forecast initiation date below changes. Forcast CFSThe CFS-base forecast uses all CFS seasonal forecast initialized during the previous month. For example, to make seasonal drought forecast starting from 21080801, we use CFS forecast initialized during 21080701 to 21080731 (62 members) to form the forecast distribution before applying the Bayesian merging method. CPCThe CPC outlook-based forecast uses the CPC output releases during the previous month as the forecast distribution for each climate division. For example, to make seasonal drought forecast starting from 21080801, we use CPC outlook released on 21080717. ESPEnsemble Streamflow Prediction (ESP) method is developed by the National Weather Service (Day, 1985). ESP uses historic meteorological data as an analogue for the future. VerifHistorical monthly averaged monitoring for the same month where the forecast is validated. Note that this won't be available for any forecasts validated at the current or future months.